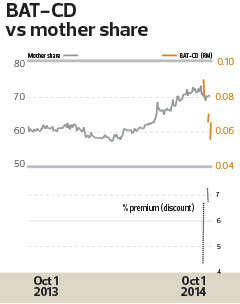 BRITISH American Tobacco (M) Bhd’s unprecedented price hike reversal in late September and its challenging prospects ahead, may dampen sentiment on the dominant cigarette company as well as the recently-listed cash-settled structured warrants BAT-CD. BAT’s stock price had appreciated 29.3% over six months to reach RM73.36 on Sept 12. While the stock has given up some of those gains — especially following the Sept 22 reversal of its Sept 8 price hike — its RM70.46 close on Oct 1 (Wednesday) was above all target prices of the 17 analysts polled by Bloomberg, ranging from JP Morgan’s RM54.30 to Credit Suisse’s RM70 apiece. It is worth noting that BAT, which commands 62% of the domestic cigarette market, earlier said it needed to raise prices to offset higher costs. JT International Bhd, which has a market share of 22%, followed suit on Sept 12, but Philip Morris International (PMI) — with 16% market share — did not raise its prices. AmResearch analyst Cheryl Tan says PMI’s decision may have been guided by a “desire to capture a larger share of the shrinking legal pie by competing on price”, rather than the fear of running afoul of the Competition Act 2010. In a Sept 14 note, Tan — who values BAT at RM66.30 — says she is reverting to her pre-price hike forecasts pending BAT’s financial results in October. In any case, BAT-CD — issued on Sept 11, a few days after BAT’s RM1 price hike — was trading at a 5% premium to the underlying share at its 6.5 sen close on Oct 1. The warrant, which has a 1-to-100 conversion ratio, RM67.50 strike price and expires on Sept 30 next year, is purely a trading instrument and cannot be converted into an ordinary BAT share. It remains to be seen if there are any price catalysts that would keep the call warrant — which is a bull-market instrument — from becoming a casualty of the price hike reversal. BAT’s volume in the first half of this year declined 5.5% from the same period last year. CIMB Research’s Eing Kar Mei calls BAT’s hasty U-turn “rational”, as the company would lose market share if it maintained its higher selling prices, especially when PMI did not follow suit. Eing, who has a RM58.10 target price in a Sept 22 note, tells clients to “reduce exposure to BAT”, adding its dividend yields are also “not attractive enough”. That said, BAT increased its first-half financial year 2014 dividends to 78 sen, from 68 sen in 1HFY2013. It is noteworthy that the government will be tabling Budget 2015 on Oct 10, when it could announce higher tax or duties on cigarettes. That’s typically the time when cigarette companies raise prices, which generally leads to higher profits. This article first appeared in The Edge Malaysia Weekly, on October 6-12, 2014.